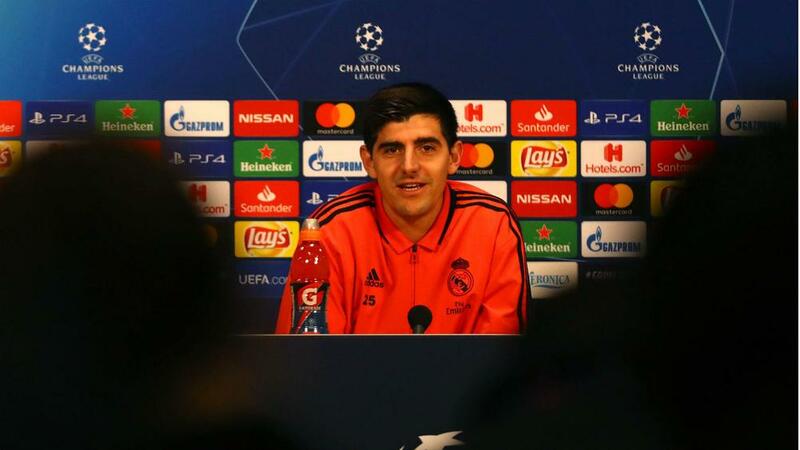 Thibaut Courtois is a fan of using technology to help out officials ahead of Real Madrid's first Champions League fixture with the involvement of VAR. UEFA will have a VAR team - consisting of a video assistant referee, an assistant video referee and two video operators - in action for all knockout games in the remainder of this season's competition. The former Chelsea goalkeeper appreciates VAR may not always work in his team's favour, even if Santiago Solari's side appeared to come out on the right end of two close calls in Saturday's away derby against Atletico Madrid. "I like it [VAR]. I think we saw in the World Cup it was a good experience with all countries in favour of VAR and it worked well," Courtois told the media. "In Spain, the same thing. "Sometimes they aren't sure about the rules and when to intervene, it needs to be a mistake, some people don't know this. But in general this is football and it if helps it's good. "Sometimes it might go against you and the same the other way, so this is fair." Their Dutch opponents qualified behind Bayern Munich from Group E, with talented young duo Frenkie de Jong - who has agreed to join Barcelona at the end of the campaign - and centre-back Matthijs de Ligt catching the eye. Courtois is also aware of the quality posed by two familiar faces from his time in the Premier League - former Manchester United defender Daley Blind and Dusan Tadic, who joined Ajax from Southampton. "I think they have a really good team - Blind and Tadic, experienced players and good players, as well as talented young players like De Jong and De Ligt," Courtois said. "They know how to keep the ball and we have to be careful. I think Ajax have shown in the Champions League they can do really well. They have a good team and qualified for a good reason. "They will give us a difficult game and we have to be concentrated. Although we have experience, we have to give everything and we will not think it will be an easy game."